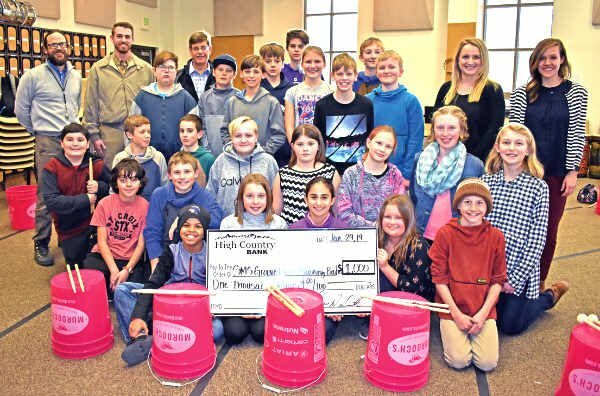 Salida Middle School’s Groove Battalion drum line receives a $1,000 donation Tuesday from High Country Bank. The money will be used to purchase drums for the group, which has been learning by using plastic buckets. From left front are Andre Abbott, CeCe Lengerich, Ruby Mossman, Emma Trollip and Brennan King. Second row: Sam Visitacion, Sawyer Pack, Anna Wilkins, Iomi Pitney, Athena Smith, Harper Hartman and Presley Thomas. Third row: Lucas Wood, Axel Sather and Zeke Wilcox. Fourth row: George Mossman, Ben Smith, Porter Post, Benjamin Devenport, Rian Baker, Travis Frazier, Cainin Becker, Priscilla Steinmetz and Avery Bechtel. Back: Rich Mancuso, Larry Smith, Dylan Grant, Justin Grant and Ethan Fast. 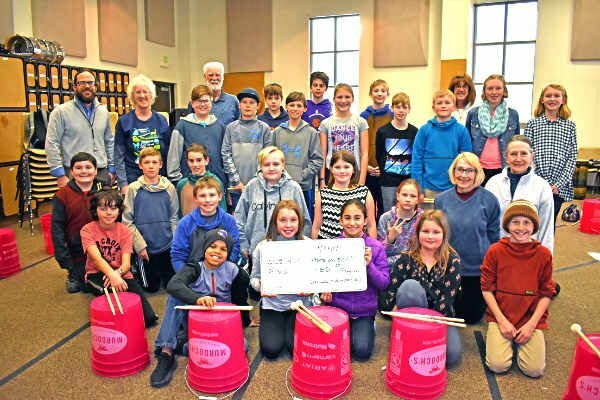 Members of The Noteables and You’ve Got Male present a $500 donation to Salida Middle School’s Groove Battalion drum corps. The middle school group, under the direction of George Mossman, has been practicing on plastic buckets but will use the donation toward purchasing new drums. From left front are Andre Abbott, CeCe Lengerich, Ruby Mossman, Emma Trollip and Brennan King. Second row: Sam Visitacion, Sawyer Pack, Anna Wilkins, Iomi Pitney, Athena Smith, Mary McConathy and Samar Fay. Third row: Lucas Wood, Axel Sather and Zeke Wilcox. Fourth row: George Mossman, Linda Taylor, Ben Smith, Porter Post, Benjamin Devenport, Rian Baker, Travis Frazier, Cainin Becker, Harper Hartman and Presley Thomas. Back: Pete Watson, Dylan Grant, Justin Grant, Ethan Fast and Marcia Rowland.